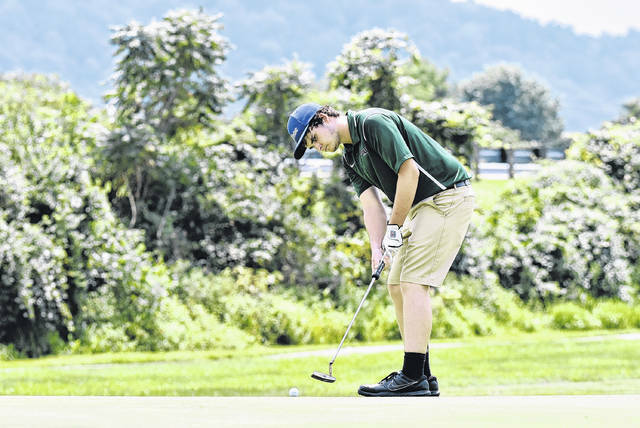 EHS senior Ryan Harbour attempts a putt during a match on August 7 at Cliffside Golf Course in Gallipolis, Ohio. A total of a nine boys and one coach from the Ohio Valley Publishing area were chosen to the 2018 All-Tri-Valley Conference golf teams, as voted on by the coaches within the TVC Ohio and TVC Hocking divisions. In the Hocking Division, seven local golfers were chosen to the all-league team, with the coach of the year awards going to league co-champion Eastern. In the Ohio Division, two golfers were bestowed with honors. Southern — which finished tied atop the standings with Eastern in the nine-team Hocking Division — was represented by seniors Ryan Acree, Jensen Anderson and Jarrett Hupp. Anderson was named to his third straight all-league squad, while Hupp also made the list for a third time in his career. EHS — which also earned three player honoree nods — was represented by seniors Ryan Harbour, Jasiah Brewer and Kylee Tolliver. This is Harbour’s fourth straight appearence on the all-league squad. Brewer is on the list for a third time in his career, having also made it following his junior and freshman seasons. First-year Eagles head coach Bill Salyer earned the Hocking Division Coach of the Year award. Wahama — which placed seventh in the Hocking Division — had just one representative in senior Gage Smith. Miller’s Hunter Dutiel rounded out the special awards for the conference, as he was named the Hocking Division Player or the Year. In the Ohio Division, Meigs — which placed third in the standings behind co-champions Alexander and Athens — was represented by senior Wyatt Nicholson and junior Bobby Musser. Nicholson received his second straight selection to the team, while Musser is on the list for the first time. Alexander head coach Eric Linder and Athens head coach Rod Burgess were both named Ohio Division Co-Coaches of the Year, while Alexander’s Whit Byrd received the Ohio Division Player of the Year award. T1. ALEXANDER: Whit Byrd*, Andrew Vogt*, T.J. Vogt. T1. ATHENS: Tyson Smith, Preston Hayes*, Ben Pratt. 3. MEIGS: Wyatt Nicholson*, Bobby Musser. 4. VINTON COUNTY: Noah Nobles, Brock Hamon. Eric Lindner (Alexander) and Rod Burgess (Athens). T1. EASTERN: Ryan Harbour*, Kylee Tolliver, Jasiah Brewer*. T1. SOUTHERN: Ryan Acree, Jensen Anderson*, Jarrett Hupp*. 3. WATERFORD: Wesley Jenkins*, Brooks Suprano. 4. BELPRE: Eric Dotson, Jeremiah Stitt*. 5. MILLER: Hunter Dutiel*, Trey Hettich. 6. FEDERAL HOCKING: Mitchell Roush.